The 37mm anti-tank gun is pretty much a copy of the German gun of the same calibre and size, only built with non-metric bolts and such. While this gun was quite effective for the Germans during the Spanish Civil War and early in WWII, by the time the US entered the conflict in the west, it was totally obsolete against German tanks. However, it was somewhat effective against Italian armor so used in the Mediterranean. Same can be said for its use against Japanese armor and it continued to be used until the end of the war in the Pacific. 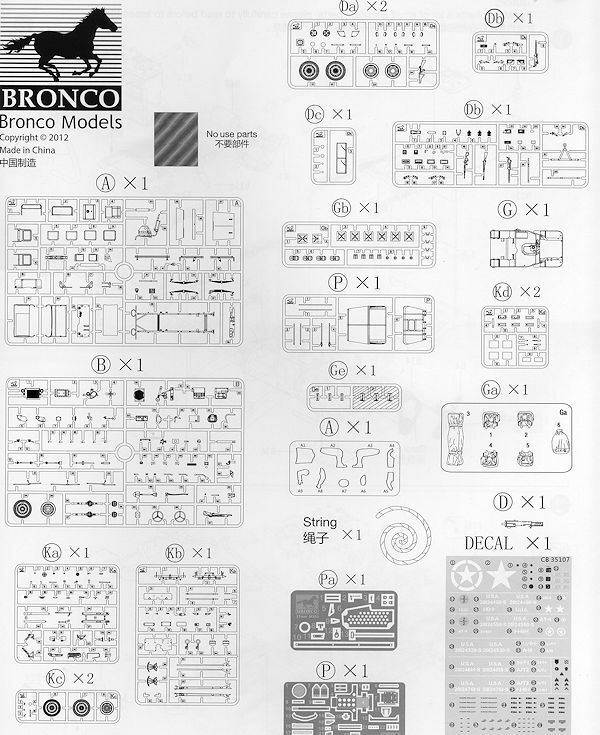 This is the second boxing of the Jeep by Bronco and like all their kits, the detailing is superb and the kit contains a rather large number of parts for such a small model. 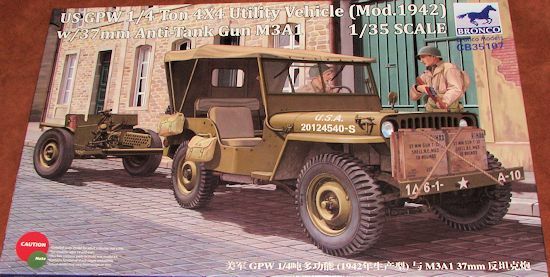 The previous boxing had the 10 cwt trailer that was often carried behind Jeeps for hauling cargo and other items, such as ammunition for light field guns. This one includes the gun, but not the trailer. The interior provides the usual seating for four and one can have the aft storage bins open or closed. One can also put shrouds over the headlights if one wishes. On the pass enger side of the dash one can install a machine gun holder. The option for one on a post behind the front seats is also provided. The windscreen can be built with the glass open or closed; the entire assembly can be posed down on the hood as well. Same for the hood, which has parts for open and closed. In the front one can install the standard bumper, one with a tow bar on it and another with wire cutter. Unlike the earlier boxing, this one has a complete top that can be modeled up if so desired. The gun is a small kit in and of itself and has to be a ton easier to build than the resin version I built many years ago. The gun is able to be elevated and trained in a limited azimuth. You can build the gun to be towed or ready for action. A number of ammo boxes and shells are provided along with some other equipment like jerry cans for the jeep. There is a driver figure included as shown on the box art. Markings are provided for five different vehicles. All of them are from the Tunisia or Sicily campaign, which is about the last place this gun was used in combat in the west. 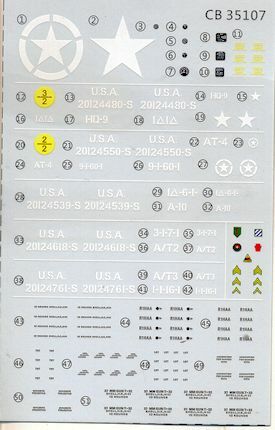 Decals are quite well printed and include markings for the driver, the ammo cases and the ammunition. Another nicely done Jeep and one that comes with a lot of options and a pretty good level of detailing as well. It is a great bonus that the 37mm is included in this one and should add to its appeal.